The descendants of Edward Franklin & Maymie [nee Mary Elizabeth Griswold] Rittenhouse meet every other year. Our next reunion will be in late July 2020 in Pontiac, Illinois. Edward and Maymie had 10 children who were raised in Pontiac, Illinois and the surrounding area. Their oldest son, Franklin Tracy Rittenhouse married Leila Byrne, the sister of Ira Byrne. Ira married Franklin's sister Vera Ruth Rittenhouse. Thus Franklin and Vera's offspring are "double cousins". 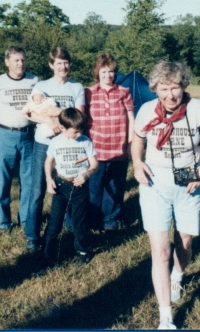 Photos on this page are from various reunions from 1950 - present.